These past few weeks leading up to Christmas have been super busy. I know, I know, everyone is busy. It's nuts. 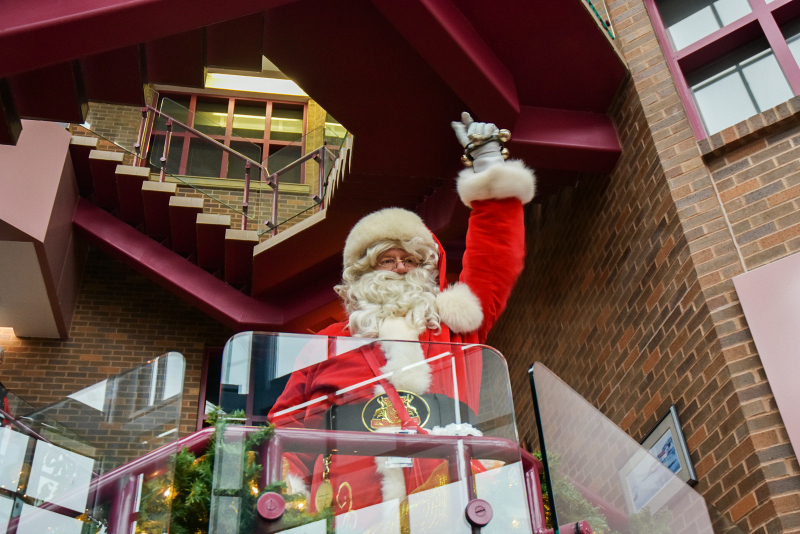 It's a crazy time of year, and we are caught up in the hustle and bustle just like everybody else, but we are loving it! It has been an exercise in coordination and a true test of our planning abilities, but Andrew and I have successfully managed to get all three children to multiple Christmas events, wrote and mailed letters to Santa, and had visits with friends and family, all while building a house and keeping up with our daily medical appointments and therapies.. even if most days we were frantically running out the door, dragging coats and bags behind us, hoping we didn't forget anything! Christmas will be different for us this year, for several reasons. We are staying with my parents right now, until our new house is ready, and while it is wonderful to be surrounded by family, we are also surrounded by boxes. So many boxes. Man, we have a lot of stuff. We don't know where all of our things are, but we have the necessities. 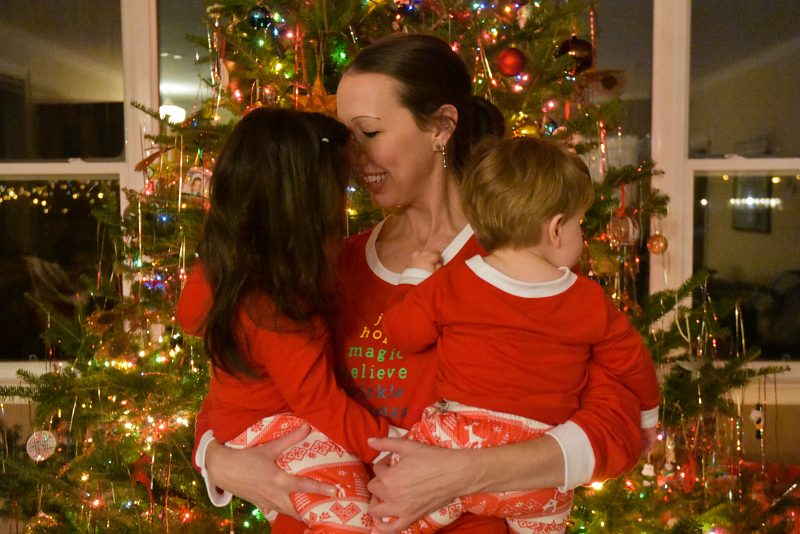 We didn't unpack our Christmas decorations, but we found our stockings and our Christmas jammies. Mom and Dad have a beautiful big tree that we helped to decorate, and while it wasn't the same as hanging our own bulbs and garland, there is something nice about sharing this one big tree with our family. The tree is a real balsam fir, and it's ten feet tall, so it smells like you're in a forest, but it feels like you're in Rockefeller Centre! Here are some photos of our Christmas so far! 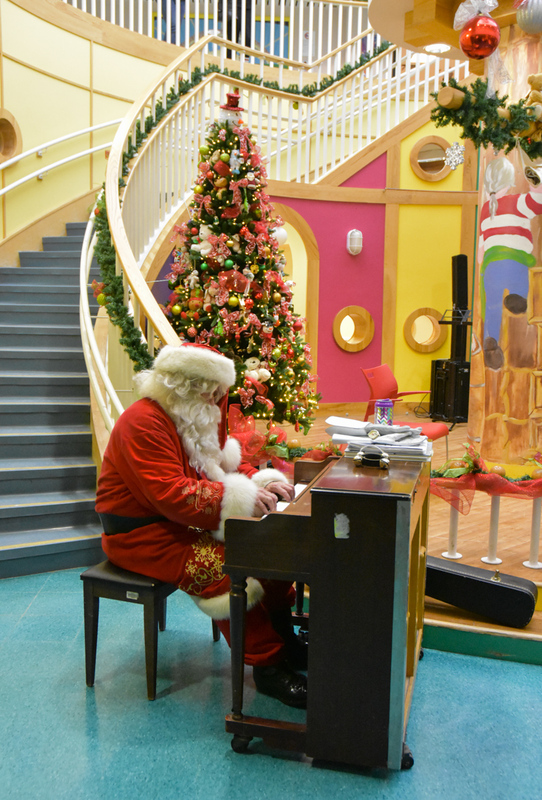 We attended the Janeway Rehab Children's Christmas Party, where we were happy to kick off the holidays with some of our favourite friends! 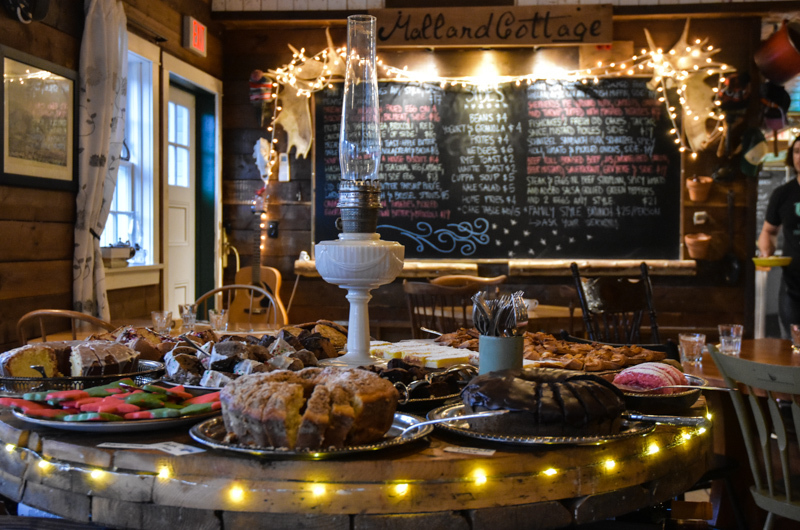 We got out for our annual Christmas brunch at Mallard Cottage. 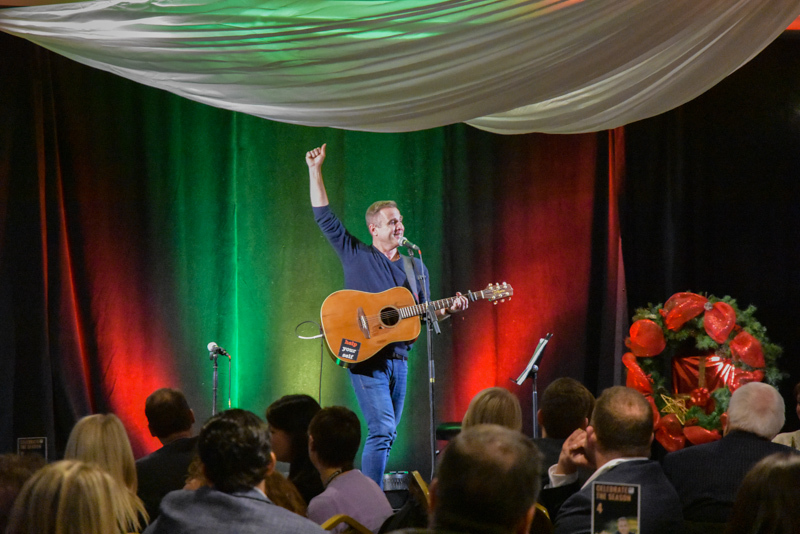 We Celebrated the Season with Sean McCann..
and attended another special Christmas celebration at the Janeway! 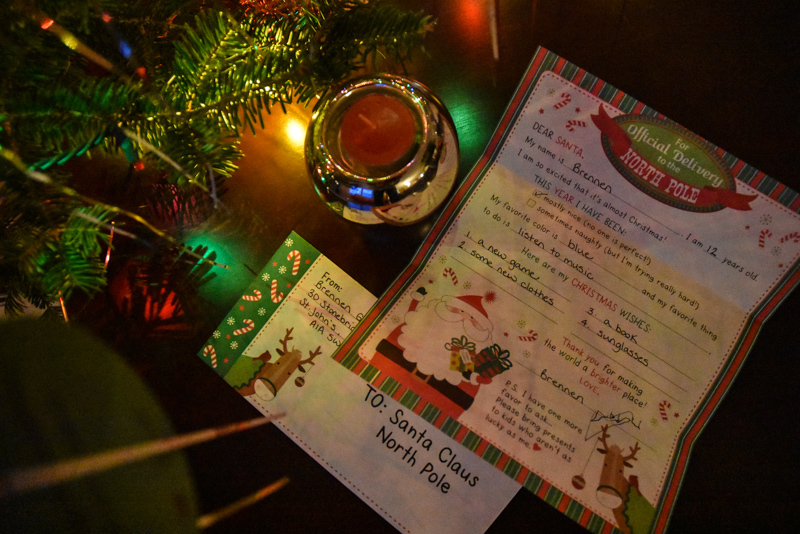 Christmas is a special time of year for us - because we make it special. 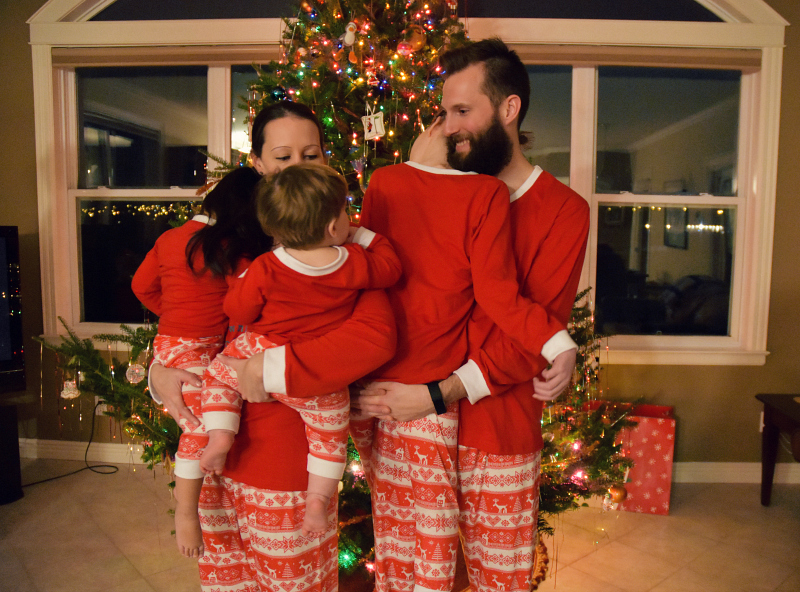 Right now, neither of our youngest children understand the concept of Santa, or reindeer, or presents under the tree, but they do understand the love that surrounds them and the beauty that exists in being part of a loving family. 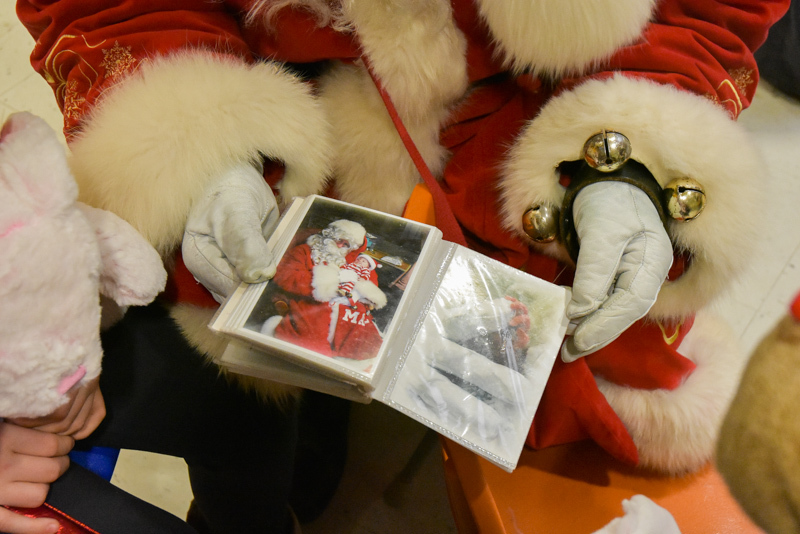 Our children know that they are loved, and that they belong, and together we are creating lasting memories of a wonderful holiday season. 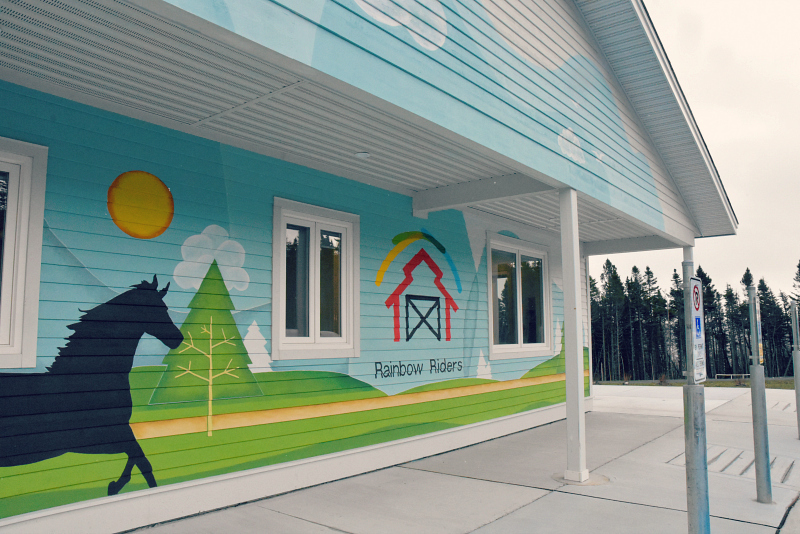 On Friday, we attended The Grand Unveil of the new Rainbow Riders Therapeutic Riding Centre! This new state-of-the-art facility has been a long time coming. I remember when Brennen first got involved with Rainbow Riders, when he was just three years old. The barn was rundown even then. The washroom was not accessible, the building was cold, and just really needed some structural upgrades. The original barn, inherited by Rainbow Riders decades ago, was well past its useful life. They offered a wonderful program, but its demand had grown well beyond its capacity, and so, recognizing that it was not able to adequately meet the needs of its users, Rainbow Riders launched the Raise It Up campaign to raise funds to help improve its facilities. The campaign raised 6.5 million dollars, and was successful in creating the incredible facility that now exists on Mt. Scio Road in Pippy Park. 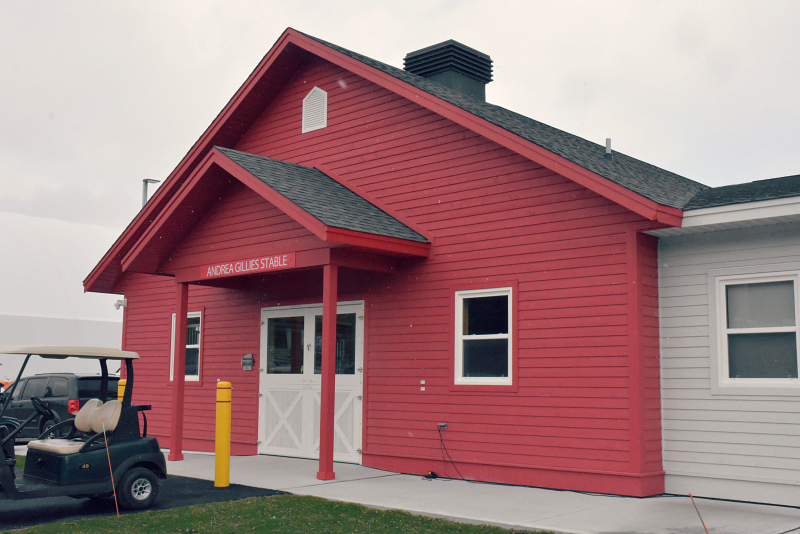 The 14 acre site houses a 16-stall barn, a large indoor arena, an Olympic-sized outdoor riding ring, riding trails, accessible washrooms, as well as an enclosed observation room and a multipurpose room. 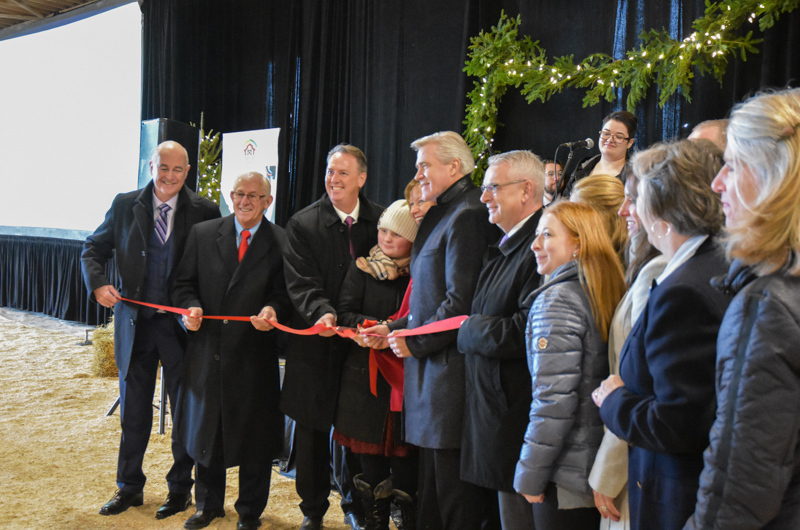 The new facility will offer customized therapeutic horseback riding programs to children and youth with cognitive and physical disabilities. 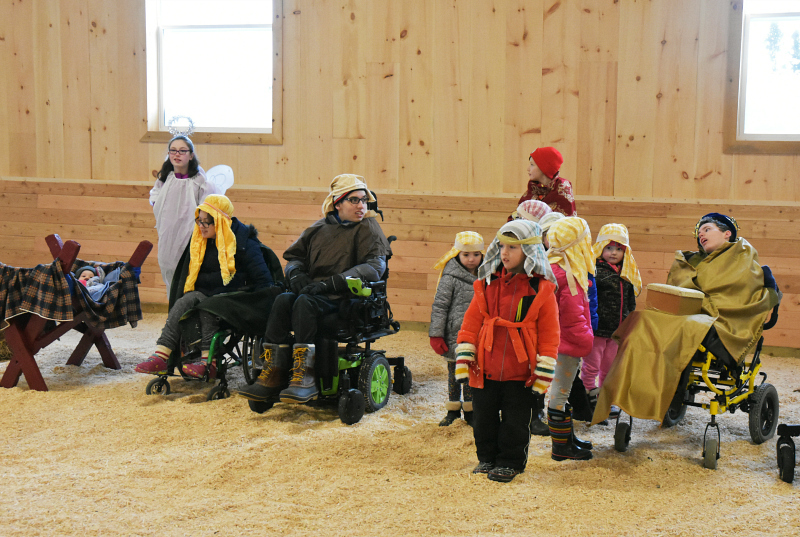 The entire barn is accessible to all, and will provide an incredible opportunity to young riders with special needs! Julia Crocker, a participant and dear friend of ours, spoke so eloquently at the reception. She said, "I am proud to be a member of the Rainbow Riders community, and to speak to you today on behalf of all riders. For me, therapeutic riding gives me the freedom to soar through the air and leave my worries behind. I have been riding for more than seven years and I love spending time with the horses. Because of my balance, I am not able to participate in some sports, but my horse, Pearl helps me with my balance and core strength and keeps me active. I love riding! Thank you to everyone who has made this possible. This facility means greater accessibility, more opportunities, and inclusion for all. We are very proud of our new rainbow riders facility and I know I can speak for everyone when I say we can't wait to see what we can achieve! 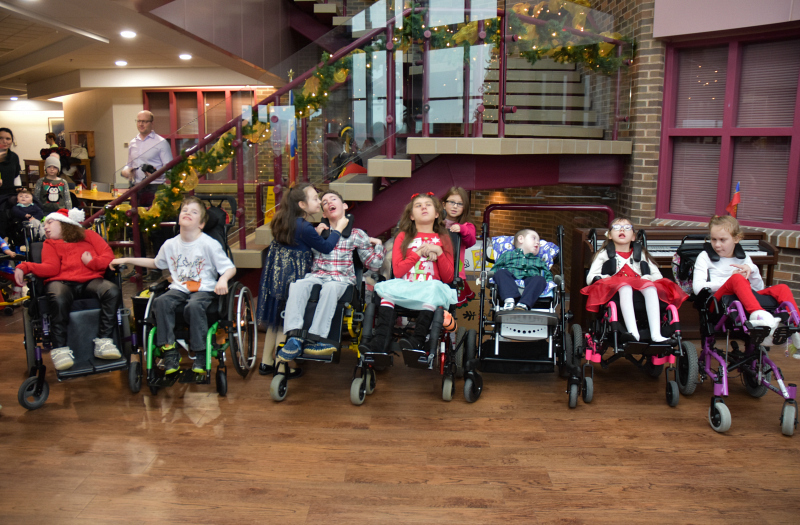 For children with disabilities, Rainbow Riders is a place to call our very own - a place where limitations are put aside and new possibilities begin. 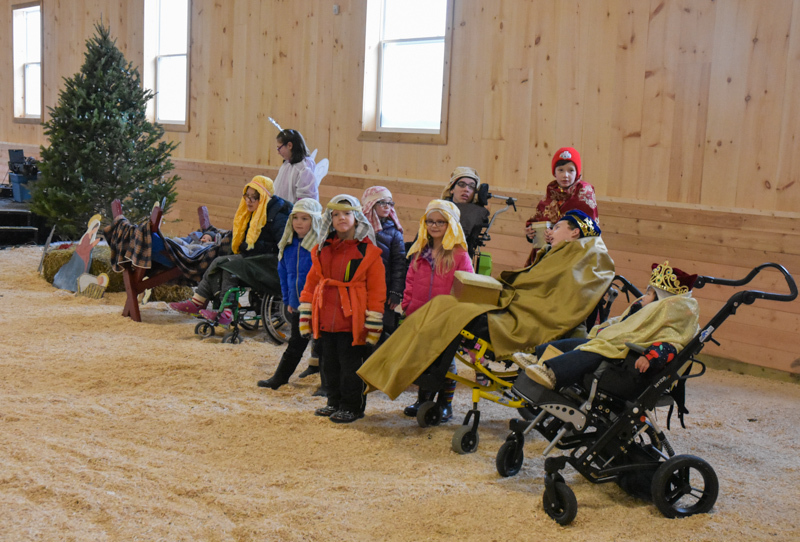 Thank you for believing in the power of therapeutic riding and for building this magical place. I can't wait to see where we can go. The possibilities are endless!" 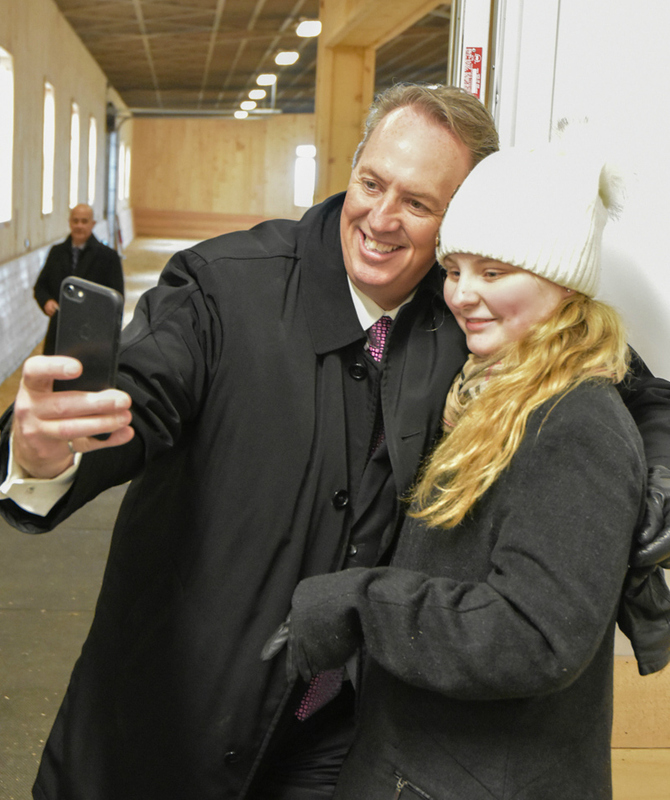 Here is Julia cutting the ribbon, and then taking a selfie with Campaign Chair, Paul Antle! Watch this beautiful video to get a closer look at the magic that happens at Rainbow Riders! 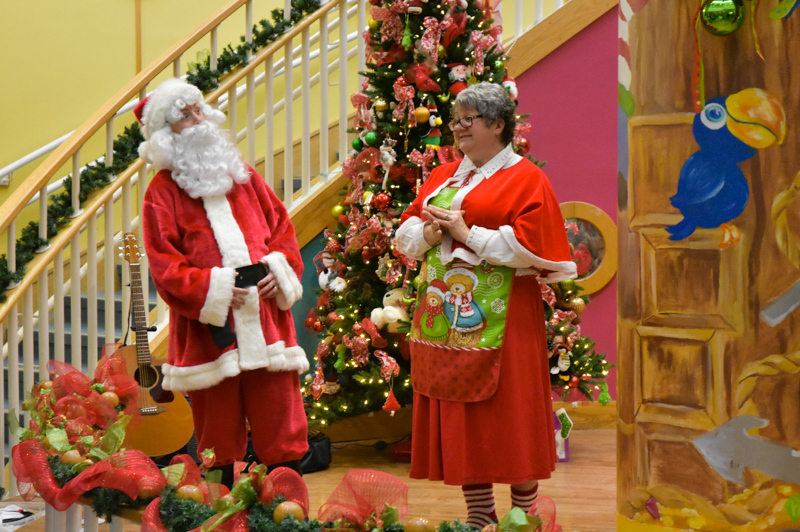 We also attended the 'Holiday Traditions Celebration' at the barn on Sunday. 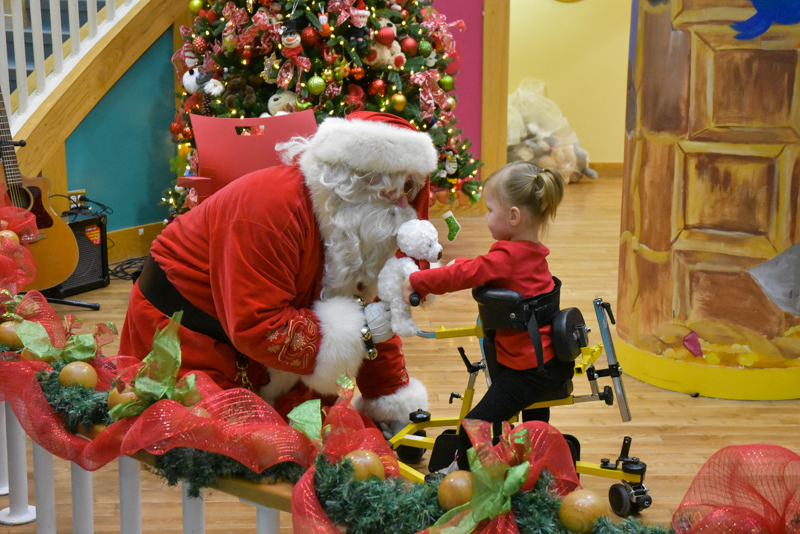 Rainbow Riders was excited to host their first Christmas event in the new facility, and it was absolutely spectacular. We are not religious at all, but the Christmas story gets me every time. 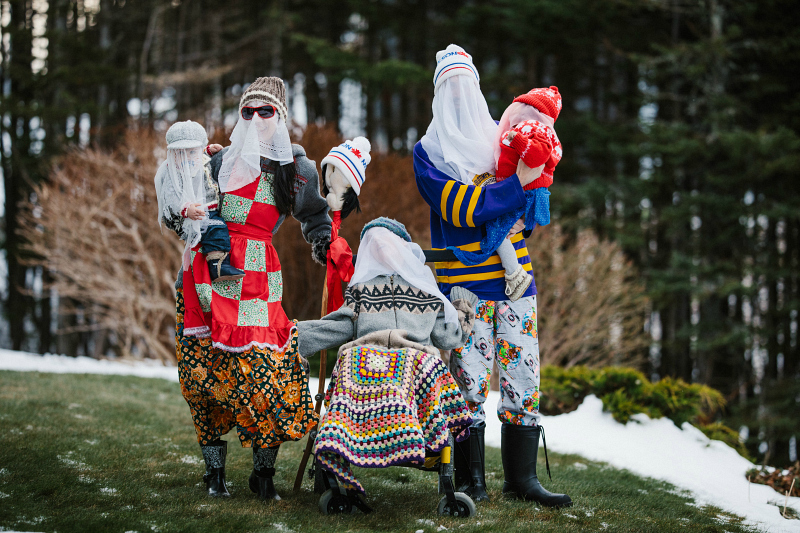 The birth of Jesus Christ as told in the New Testament was represented by young riders and children from the community. Brennen has played a Shepherd in the live nativity for several years now, but this year he was a Wise Man! As they all took their places, a band softly played a beautiful rendition of "Away in a Manger". 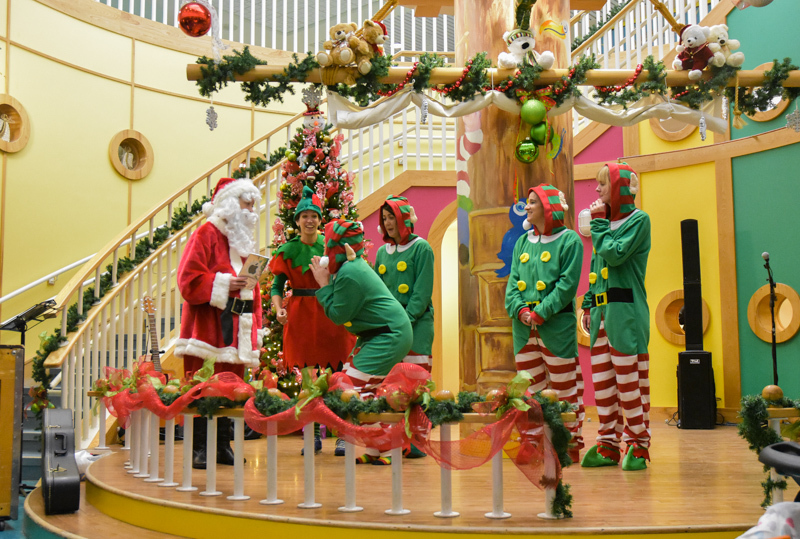 It was quite moving, and really made you feel the true spirit of the holidays, and what Christmas should be about. It's the very essence of childhood - the sense of wonder and the innocent belief in possibility that is so strong this time of year. This event was a special one for us, and we were happy to share it together as a family. Congratulations to Rainbow Riders on the completion of their incredible new facility! We are excited for the future of the organization, and for all of the potential that it holds! I am so honoured to be featured in Today's Kids In Motion magazine! 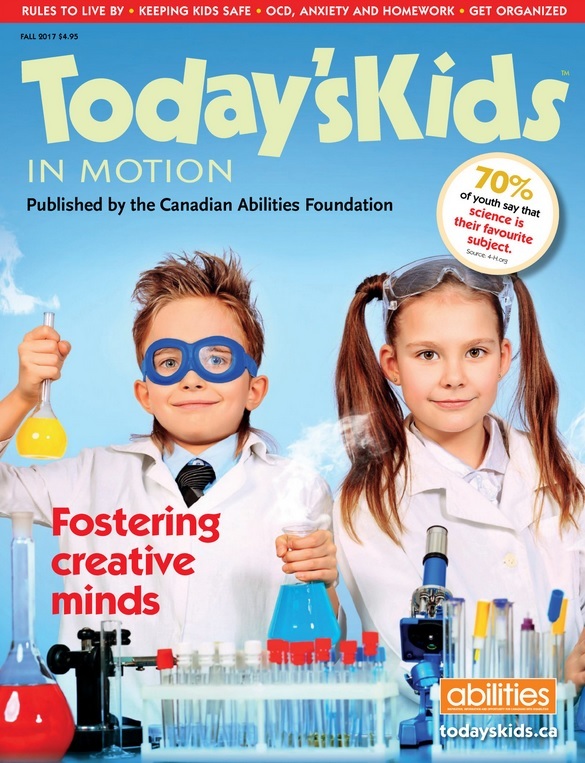 If you're not familiar, Today's Kids In Motion is a Canadian pediatric health publication for families of children with special needs. I was thrilled when they reached out to me, asking if I would share an article for the Fall 2017 issue of the magazine. My article is HERE! and I have copied it below. It might be a good read for anyone who is new to my blog! Brennen was born full-term, two days before his due date, in Sacramento, California. It was a normal pregnancy and delivery, although I replay it constantly in my mind, trying to recall if there was something I’d missed. I was sent home from the hospital with a “healthy baby”, and we were over the moon with joy and love for our precious baby boy! Until he started crying… and crying… and crying. You might think I’m exaggerating, but it is the truth - he didn’t do anything but cry for 5 whole months. I knew there was something wrong, but had no idea what. We went back to our doctor every other day. She told me he was a “colicky baby” and he would outgrow it. That didn’t happen. Feeling like I was not being taken seriously, and getting no sort of resolution, Brennen and I left California and came home to Newfoundland where we had the loving support of my family. Almost immediately after arriving back home, we got in to see a pediatrician at the Janeway Child Health Centre. Though I knew there was something wrong with my child, I was not prepared for what I heard on that first encounter. Words like “serious”, “urgent” and “critical”. All of a sudden we were in an emergency situation and needed a battery of tests to be done right away! We were sent to neurology, cardiology, genetics, ophthalmology and audiology, among others. Brennen had a CT Scan, MRI, EEG, EKG and ultrasound all the matter of days. It was a whirlwind of tests and probes. I couldn’t believe what was happening. I knew that Brennen was behind on his milestones (ie. hadn’t met ANY), and I knew something was not right, but I wasn’t prepared for what they were about to tell me. My perfect little baby boy had something seriously wrong with him and there was nothing I could do about it. It was such a helpless feeling. I knew they were testing for conditions that I couldn’t even bring myself to contemplate. We were referred to physiotherapy, occupational therapy and speech therapy, all to begin immediately. 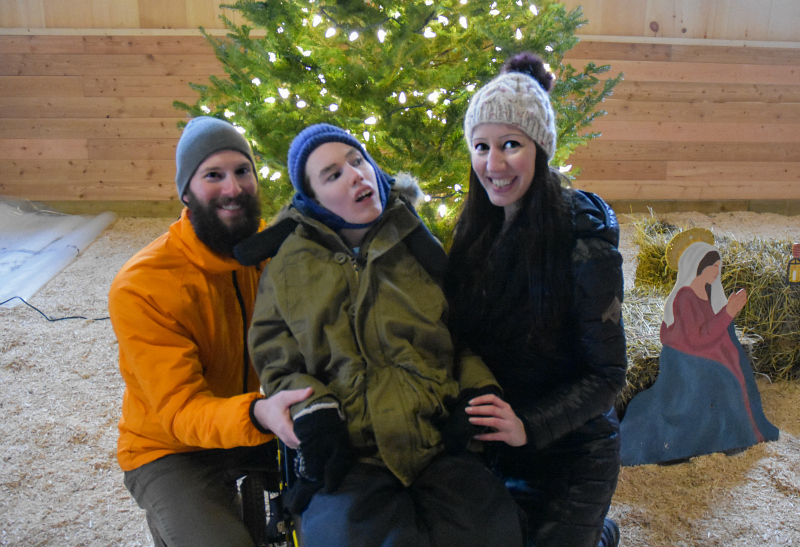 When Brennen was eight months old, after blood test after blood test had come back negative, we were given the diagnosis of Spastic Tetraparetic Cerebral Palsy. Spastic meaning stiff muscle tone, and tetraparetic meaning that it affects all parts of his body. As difficult as that was to hear, it was almost a relief. They say the scariest thing in life is the unknown, and now at least we knew what we were dealing with. It wasn’t going to go away. It wasn’t going to get better, but it wasn’t going to get worse. As well as I think I handled the diagnosis, I was surprisingly knocked off my feet by the suggestion that I join a “CP Support Group”. Was it THAT bad that I needed a support group?! Support groups, I thought, were for people dealing with some sort of horrific tragedy or loss. I wasn’t one of those people, was I? What I was about to learn was that I was going through both of those things, and all of the emotions that go along with them. The tragedy of what had happened to my perfect unborn baby, and the loss of the child that I thought I was going to have. It was a mourning process, for sure. When I think back on those early days, when I thought I was alone in the world, and that I would never have any sort of “normal” life again, I wish I could go back and tell myself that it really was going to be ok. When I look at our life now, I could never imagine things any other way. 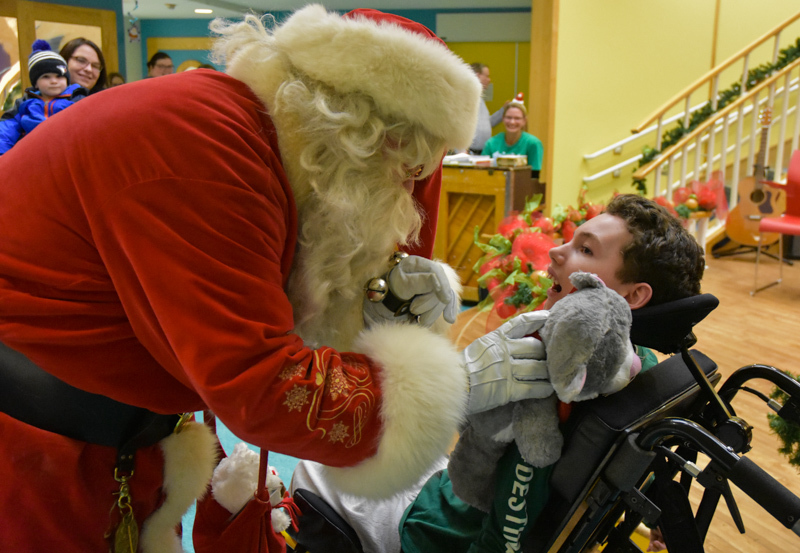 Brennen is a happy boy who loves life and spreads that love with everyone who knows him. He brings us so much joy every day and has taught me more about life than I ever could have imagined. The past twelve years have been filled with doctors’ appointments, surgeries, therapy sessions and ISSP meetings. We have spent a small fortune on medical equipment, adaptations and therapy devices. We have learned who our friends are and who they are not. There have been dark days, but they make the good days that much better. Most recently, Brennen underwent a spinal fusion surgery where he had instrumentation (2 rods and 42 screws) attached directly to his vertebrae to support his spine. The procedure took six hours, and thankfully there were no complications. He has been doing surprisingly well since his surgery, which is great, but I cannot deny the true and very real pain of knowing that my child has to experience a life that has so many struggles. Brennen is amazing and he fights it with everything he's got. His resilience, determination, and courage are far greater than my own. The journey we are on is a unique one, and I have come to terms with the fact that there will always be challenges and road blocks along the way. In the meantime, I will invest all of my time and love and energy into my son and supporting every single one of his complex needs. Brennen is now headed into Grade 6, and I am thankful that he has wonderful teachers who love and support him. 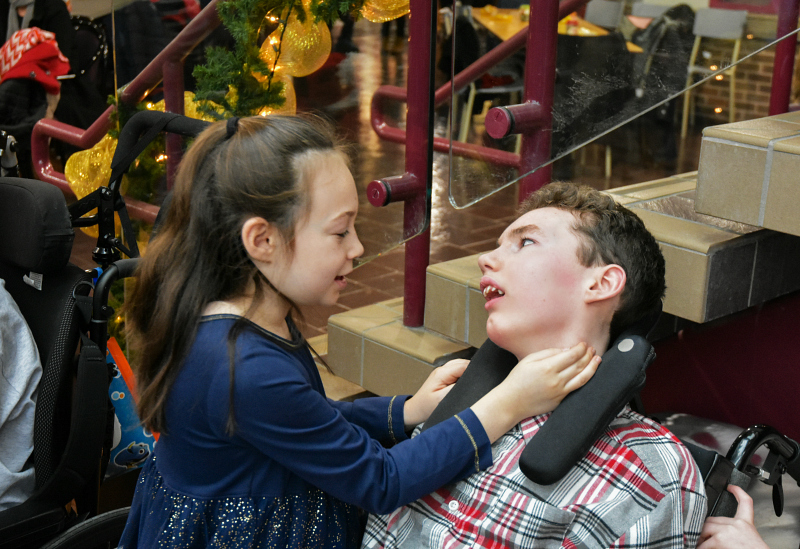 Brennen gets lots of attention and cuddles and love at school, and really, that is what I want for him. I want him to be happy and to be surrounded by love. That is all. Anything beyond that is a bonus. This whole unexpected journey has taught me so much about myself, my relationships, and about love in general. I never could have fathomed that in such a short time, Brennen would change my world in the best way possible. He continues to teach us what strength truly is and we are so inspired by our brave little boy. Life is good, because he is in it. 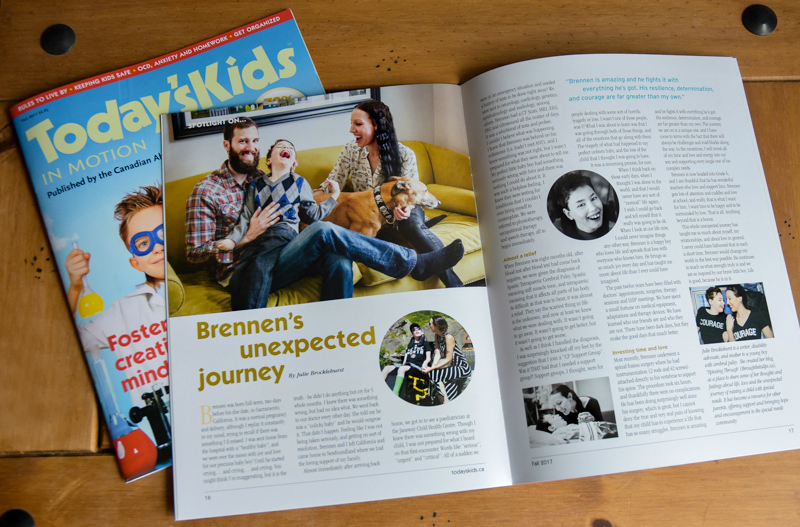 A huge thank you to Today's Kids In Motion for featuring us in their magazine! 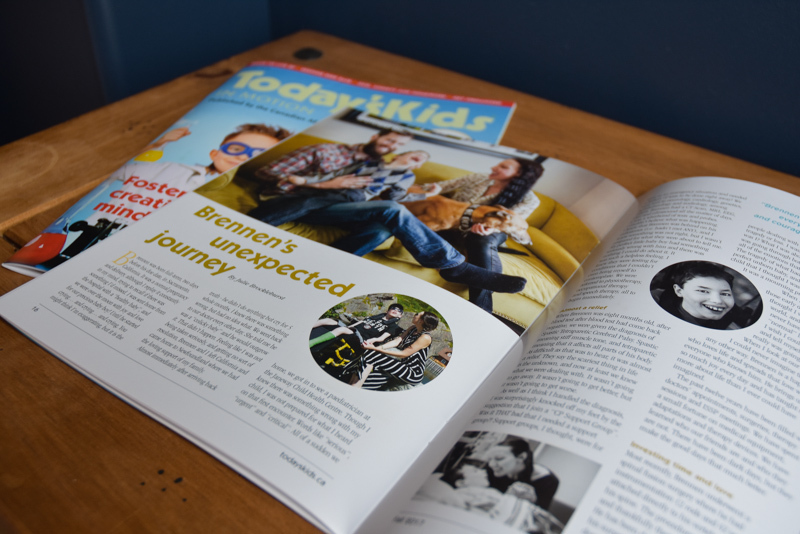 I am thrilled to be part of such a wonderful publication that deals with issues facing parents of children with disabilities in a positive way, and celebrates the joys of one of life's greatest gifts.